Multi-player gaming in the real world? 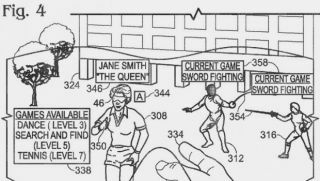 Microsoft is plotting a pair of Augmented Reality specs to allow users to play multiplayer games in 'real space,' according to a recent patent application. The glasses, which first appeared last year in leaked Xbox documents codenamed 'Fortaleza', could be used to start multiplayer games and improve the overall experience thanks to multiple built-in sensors. As explained by the filing, the glasses would receive eye tracking information, facial recognition data, depth information and voice data, which could be used to invite players to participate in games. As well as improving the multiplayer experience on the TV screen, the glasses could be used to generate virtual reality gaming experiences, such as dance-offs, sword fights, tennis matches and more. How does Kinect fit in? Currently the means of using the glasses for gaming isn't entirely clear, but it appears they may work in tandem with the Kinect sensor to enable more immersive experiences. The filing reads: "A system and related methods for inviting a potential player to participate in a multiplayer game via a user head-mounted display device are provided. In one example, a potential player invitation program receives user voice data and determines that the user voice data is an invitation to participate in a multiplayer game. "The program receives eye-tracking information, depth information, facial recognition information, potential player head-mounted display device information, and/or potential player voice data. The program associates the invitation with the potential player using the eye-tracking information, the depth information, the facial recognition information, the potential player head-mounted display device information, and/or the potential player voice data." "The program matches a potential player account with the potential player. The program receives an acceptance response from the potential player, and joins the potential player account with a user account in participating in the multiplayer game." Last year the glasses leaked a document explaining the transition into the new gaming era at Microsoft. Those documents mentioned the Xbox One, the launch of a pay TV service next year and the launch of AR glasses in 2015. It's clear that Microsoft isn't planning a Google Glass clone, but everything still seems quite vague. Do you think we'll ever see the glasses upon the heads of Xbox One gamers? Let us know in the comments section below.